Oh for crying out loud....here I announce that I am doing a cup a day and then what?? ....I blow it and don't post one for yesterday. Well, honestly I do have an excuse (sort of). I woke up yesterday morning with aches & pains & a little scratchy throat and almost turned over and didn't get up. But since it was the last day of this year's Wednesday Bible Study and I also had a Book Club Luncheon scheduled, I hoisted my body out of bed, took 3 ibuprofen and went on to attend both events. By the time I got home, I was feeling poorly again, took 3 more ibuprofen and promptly fell asleep on the couch with the sun warming my aching body. Now, honestly I didn't know if I was getting sick (horrors, no time for that) or just too much lugging boxes and bins up and down the basement stairs causing my body to react to all that exercise. I think it was the extra stress on the muscles (??) because this morning I am feeling better. So hopefully I am back on track. Whew, that was a long paragraph to explain why I didn't post. Looks like my little angels are paying homage to my morning cup of coffee...that is exactly the way I feel every morning, a little love for that sweet cup of brown liquid. 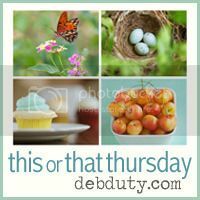 Do you have a favorite brand of coffee? Right now my favorite seems to be Dunkin Donuts original. For years I loved 8 O'Clock, but then the price started rising and I backed off from buying it. While I was in the store last week, I noticed it is now priced at $18.80...yikes. When I was a regular 8 O'clock drinker it was less than $10. I am not a fan of Starbucks (does that make me un-American?). Sure would love to hear what your favorite bean is. 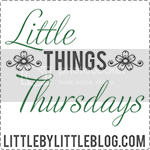 Linking up with Deb at This or That Thursday and Kim for Little Things Thursdays. Good morning, Deanna! I think we will all forgive you for not posting yesterday :)! I sure hope you are feeling better! Love your cup today, and the bokeh! Glad you're doing better. All the lugging of boxes this time of year, does take a toll. That is a cheerful cup this morning. And...agreeing with Barb...great bokeh! gosh, i sure hope you feel better real soon. that stinks to have tons of things to do & not feeling quite up to par. relax. get your vitamin C & feel back to normal asap!! Lovely Christmas Bokeh! I hope you are feeling better. I agree that there is no time to be sick this month! I'm a new coffee drinker. I do like Starbucks flavored coffees at Christmas, but the regular coffee is a bit much for me. I do a Keurig brewer at home with various light roast coffees from Green Mountain. I hope your feeling better. 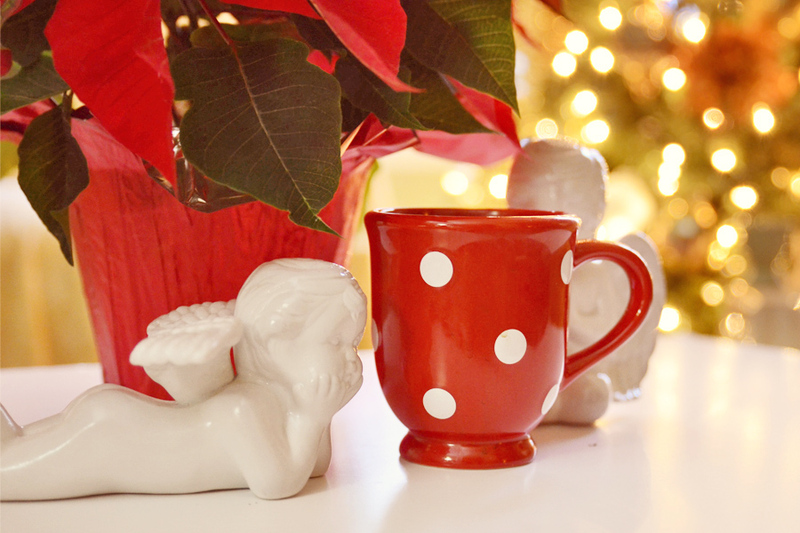 Love the poinsettia and todays cup, polka dots are always cute. That polka-dot cup is so "you"! As you know, I'm a tee-totaler, no coffee for me. Does that make me un-American? Surely not ... it's all about diversity. laughing at you missing yesterday. but glad you're feeling better! i like the angels in this one. i am not a starbucks fan, either. too strong for me. i drink plain old folgers. but i do like mcdonald's coffee if i'm out and about! Every time I see a coffee/teacup in the store, I think of you! Give me cheap Folgers for home; but I love McDonald's coffee! Lovely picture, perfect bokeh and accessories to that delightful cup of java. I am a latte (French Van.) type of girl and don't actually like regular brew. I vary from brands depending on the best deal and if not using a Kcup, favor WalMart (Sam's Club) French Vanilla over Starbucks. Guess I'm a bit un-American that early in the morning as well. I was actually looking for a little "snippet" from springfield yesterday! lol! Your pictures and adventures always brighten my day! Glad to hear you are on the mend! My current fave coffee is also Dunkin' Donuts. I get the giant bag at Sams since trophy husband is also a coffee drinker. Honestly, plain old Folgers is pretty good. I like the Breakfast Blend because it is a little milder but the Classic is good. I hear they have a half-decaf blend that is good and probably what trophy husband should be drinking! I am not a Starbucks fan either. Their coffee always tastes burnt to me. But if there is enought sugar and milk and flavorings in it that's another story! Of course that's about a zillion claories! A very rare treat indeed! Deanna! no! it makes you a common sense woman that doesn't heed to the peer pressures. smile, you are just fine. My favorite bean, why that would be the Texas Pecan kind with my french vanilla coffee. Sometimes I will throw a little cozy winters night in there for a different blend, maybe some chocolate, but it always starts with my pecan. As for Starbucks, oh I have to say that the one drink I adore from there is their Salted Caramel Mocha, hot, cold, anything inbetween, and with a spoon please, to get every last yummy drop of that whipped cream, salty, caramel goodness they put on top. But it's seasonal, so I venture over often and sit inside with a book or my journal and just enjoy! Whats NOT to love about this image!!! Just adorable girlfriend!!! Are you feeling better today I hope? It's terrific that you are up and running again this morning. Don't get sick... it 'ain't' no fun!! I'm glad you're feeling better, Deanna! Love the red and white cup. Hi Deanna, hope you're feeling better. Be careful with Ibuprofen - it can cause heart issues. I used to take it all the time but no more. Great Christmassy photo. As everyone has said I do hope you are feeling better and not getting a Christmas cold. Take care. Hands down I LOVE Starbucks and use it every morning whole beans and grind them myself. Completely black no milk and strong is what makes me go in the morning. If you had listened to my advice from the post where you put your printer together yourself, you would not have been aching from dragging boxes...didn't I ask you to wait until you had help? sheesh. You're as bad as my mom. :) Glad you weren't coming down with the flu. Isn't it funny how it FEELS like the flu when we use muscles we are not used to using? Not too funny though. I have tried to like coffee, but it just isn't in me. I guess I must be un-American, too, since I don't like ANY coffee. I do like your polka-dot mug, though! Do You Have a White Board? ?